I haven’t done any new drawing or painting in almost a year. I’ve had a crazy time with my health and most of the time have not been well enough to create, plus I have not been feeling particularly inspired, so I did not want to push it. One of my awesome doctors recently gave me an ‘important prescription’ – a colouring in book for adults, to gently get me back in the zone, with no pressure, and to just have fun. 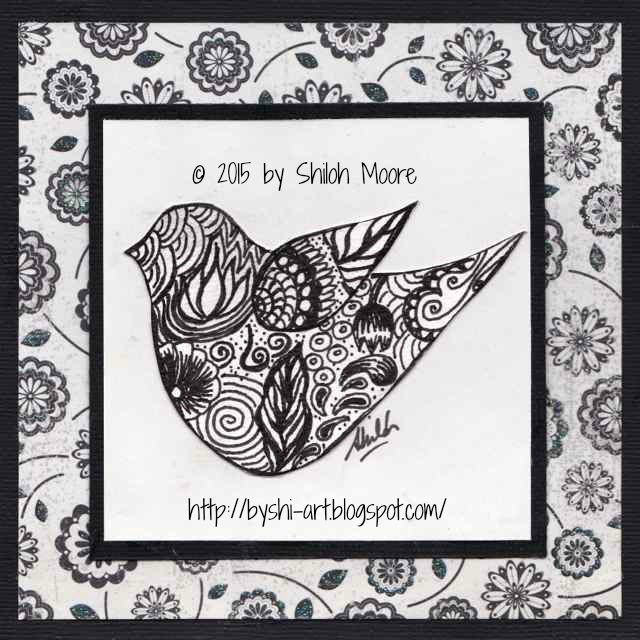 The next day, another friend recommended I google ‘Zentangle Art’ and get into awesome creative doodling. I’ve never been much of a doodler – I have mind blanks and put too much pressure on myself to not make a mistake! But I thought I’d give it a try. So my first attempt I used the outline of my doves in ‘Be Free’ (ByShi Blogpost Feb 12 2012) which I used again in ‘Dove Tree Mandala’ (ByShi Blogpost Sept 23 2012). I was not well enough to sit for long to do this, so I lay on my side and drew in the way I illustrated in my post ‘Living With ME and FM Series – Lying Down’ (ByShi Blogpost Jan 18 2012). This was my first attempt at Zentangle and I thoroughly enjoyed it. Later that day I tried ‘Zentangle Part 2: Dachshund’, which I will upload soon, so stay tuned!! !